The church is the extended family of God. What makes a Biblical Fundamental Local Church? Understanding the ordinance of baptism. The responsibilities in our profession of baptism. Understanding the ordinance of the Lord's table. The responsibilities of taking the Lord's table. The Biblical leadership of the local Church. Syllabus for God's Pattern for the Local Church, in His Extended Family. The primary unit in the family of God is the individual, the next is the family unit or the home. The largest unit in God’s extended family is the Church. 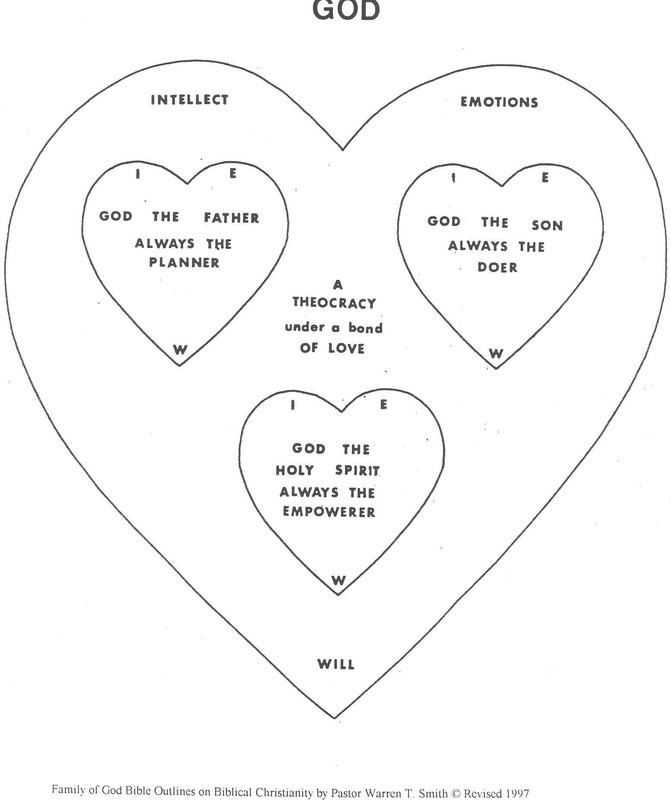 God established the pattern from Himself being triune in nature. He used the pattern of a patriarchal and theocratic government as we have seen to man, the home, and His Church is to follows that same pattern, of the Godhead. 2. Assignment: As we are looking at the church as seen through the eyes and heart of God, let us examine our own church to see if it is following God’s pattern for His Church. If it is not, consider the steps to be taken to bring it into God’s pattern and place of His blessing. God's Word speaks of the church from two aspects. 2. As a Local Church Family: yoked together, for the purpose of carrying out the work of God in their local communities, functioning as the body of Christ in this present world. What makes a Biblical Fundamental Local Church? An assembly of saved, baptized believers, who are bonded together accepting the responsibilities of their union in Christ under a pastor as their under-shepherd in Christ's stead. All in the church recognizes the Bible (God's Word) as their sole authority for faith and practice, by which they are fed as the flock of God, and so they are governed by Christ (the living Word made flesh) as the Head of the Church. Consider: John 14:15-26, Acts 1:8, 4:24-33, 2 Cor. 5:14-21. The apostles' doctrine was the knowledge of the Lord, as revealed in the Old Testament, and their first hand knowledge of His birth, life, death, resurrection and ascension. It included all that He had taught them. The apostles' doctrine taught them to understand God's nature, and character, to be the pattern for their lives and ministries. Consider: Acts 8:12 Consider one exception. Luke 23:39-43 Baptism is to be by immersion as Jesus was, a demonstration, visual aid as it were of their commitment to Christ. 1. Christ's life, death, and resurrection. 2. Our old life is dead with Him and we have a new life to live for Him. Note: Baptism is only for those who have received Christ as their Saviour, it is a testimony of their commitment of a new life in Him. 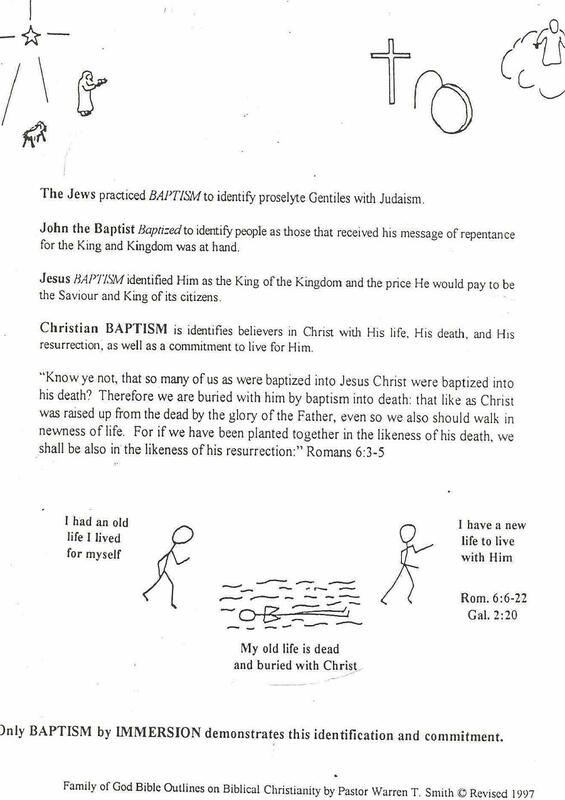 Therefore, it rules out baptism for infants, unsaved or the dead. 1. To live a life manifesting Him. "For the love of Christ constraineth us; because we thus judge, that if one died for all, then were all dead: And that he died for all, that they which live should not henceforth live unto themselves, but unto him which died for them, and rose again Wherefore henceforth know we no man after the flesh: yea, though we have known Christ after the flesh, yet now henceforth know we him no more. Therefore if any man be in Christ, he is a new creature: old things are passed away; behold, all things are become new." 2 Cor. 5:14-17 . The Lord taught us: "For I have received of the Lord that which also I delivered unto you, That the Lord Jesus the same night in which he was betrayed took bread: And when he had given thanks, he brake it, and said, Take, eat: this is my body, which is broken for you: this do in remembrance of me. 1 Cor.11:23-24 "Take eat" In doing so we testify of our union with His death. "After the same manner also he took the cup, when he had supped, saying, This cup is the new testament in my blood: this do ye, as oft as ye drink it, in remembrance of me." .Vs 25-26. The cup is a symbol of His new covenant with us established by His shed blood. 1 Cor.11:26 "For as often as ye eat this bread, and drink this cup, ye do shew the Lord's death till he come." We are to remember the price of His giving up His life for us. Not only what He did, but the way He did it! "I gave my back to the smiters, and my cheeks to them that plucked off the hair: I hid not my face from shame and spitting. . . . . Surely he hath borne our griefs, and carried our sorrows: yet we did esteem him stricken, smitten of God, and afflicted. But he was wounded for our transgressions, he was bruised for our iniquities: the chastisement of our peace was upon him; and with his stripes we are healed." Isa. 50:6 . . . . . 53:4-5 The remembrance of His sacrifice should cause us to love Him, live for Him, and be looking for His coming. For this reason the ordinance of the Lord's table is only for those that have received Him as their Lord and Saviour. Easton's 1897 Bible Dictionary says: "SHEPHERD a word naturally of frequent occurrence in Scripture. Sometimes the word "pastor" is used instead (Jeremiah 2:8; Jeremiah 3:15; Jeremiah 10:21; Jeremiah 12:10; Jeremiah 17:16). This word is used figuratively to represent the relation of rulers to their subjects and of God to his people (Psalm 23:1; Psalm 80:1; Isaiah 40:11; Isaiah 44:28; Jeremiah 25:34-35; Nahum 3:18; John 10:11, 14; Hebrews 13:20; 1 Peter 2:25; 1Peter 5:4). The duties of a shepherd in an unenclosed country, like Palestine, were very demanding. In early morning he led forth the flock from the fold, marching at its head to the spot where they were to be pastured. Here he watched them all day, taking care that none of the sheep strayed, and if any for a time eluded his watch and wandered away from the rest, seeking diligently until he found and brought it back. In those lands sheep require to be supplied regularly with water, and the shepherd for this purpose had to guide them either to some running stream or to wells dug in the wilderness and furnished with troughs. At night he brought the flock home to the fold, counting them as they passed under the rod at the door to assure himself that none were missing. Nor did his labours always end with sunset. Often he had to guard the fold through the dark hours from the attack of wild beasts, or the wily attempts of the prowling thief (see 1 Samuel 17:34). Often herding the sheep into a crack or cranny in hilly countryside for the night, laying down in the opening, so that a predator would have to pass over the shepherd in order to get at the sheep. Let us consider Psalm 23:1-6 "A Psalm of David. The Lord is my shepherd; I shall not want. 2He maketh me to lie down in green pastures: he leadeth me beside the still waters. 3He restoreth my soul: he leadeth me in the paths of righteousness for his name's sake. 4Yea, though I walk through the valley of the shadow of death, I will fear no evil: for thou art with me; thy rod and thy staff they comfort me. 5Thou preparest a table before me in the presence of mine enemies: thou anointest my head with oil; my cup runneth over. 6Surely goodness and mercy shall follow me all the days of my life: and I will dwell in the house of the Lord for ever." In these two passages we see many important functions of a shepherd. 1. He cares for the flock: He feeds them, gathers the young, carrying and leading them He meets the needs of the flock: We see it again in Psalm 23. "The Lord is my shepherd; I shall not want" He serves the flock they do not serve them. He leads them into the place of the Lord's blessing: beside the still waters He leads them in the paths of righteousness for his name's sake." Consider: Acts 20:28; John 21:15-17; 2 Tim. 3:16-17. 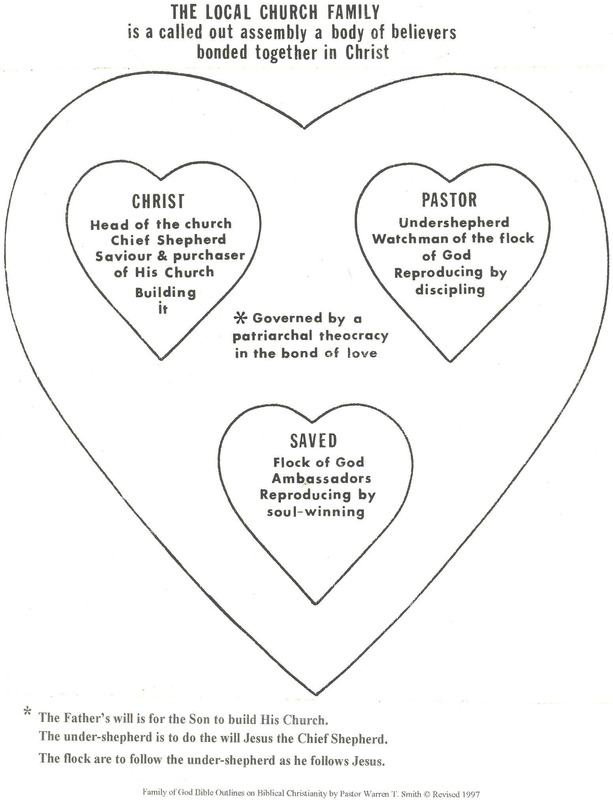 Deacons are invaluable assets to the under-shepherd of the local Church in church in receiving their perspectives in decisions the under-shepherd may be considering to make. As they are equally dedicated men to the Lord and His flock. Deacons are also invaluable assets to the under-shepherd of the local Church in church discipline, and stopping gossip. Consider: "Against an elder receive not an accusation, but before two or three witnesses." 1 Tim. 5:19 This is also true of anyone in the church. Example: When someone comes to them with a tale, they ask if there are witness, if so the deacon or deacons take them to the under-shepherd, and they go to them and to the offended party. They determine the truth of the matter and deal with it as Christ would. If the tale bearer does not have such, the deacon tells that one to go to the under- shepherd and ask him or tell him but no one else. The deacon then reminds that one he will tell the under-shepherd in the event that person forgets. That usually ends the gossip. Teachers in the Church They are to be the under-shepherd or deacons. However, equally dedicated women are better examples of a scriptural woman and mother to those of her own gender. Church constitutions, covenants, policies and other agreements generally contain Scripture telling the order and method those of that church agree to in following God's will for the Church. These, however, are the will of man and not necessarily that of God and should not be proclaimed as Scriptural doctrine. The bottom line of responsibility of becoming a Christian and joining God's family serving in a local church is obvious. Simply put: It is to give Christ the life He paid for, letting Him live His life in and through us to others, Amen. Self test: on God's Pattern for the local Church Family, in His Extended Family. Q1. What is a church? Q2. Who heads or directs it? Q3. On what does Christ build His church? Q4. What is the primary responsibilities of the following . . . .
Q5. What is the purpose of Baptism? Q6. What is the purpose of the Lord’s Table? Q7. What is the primary purpose of the church?